A trustee of a struggling academy chain, David Hoare, has been announced as the new chairman of Ofsted. Mr Hoare was brought in to help large academy chain AET with difficulties. AET has been stopped from taking on further schools. The Department for Education (DfE) said Mr Hoare, who joined AET in January, will step down to take up his new post in September. He was appointed for his business experience, the DfE said. The Academies Enterprise Trust which runs about 70 of these state-funded schools, was warned in March last year that it could not take over any more schools. Some AET academies were criticised by Ofsted for failing standards and a letter summarising the results of a recent round of inspections was due to be published this week. This has now been delayed until September, but the findings are understood to be unfavourable for the chain. The Ofsted post became vacant in February when ministers failed to renew the then chairman Baroness Morgan's contract. Education Secretary Nicky Morgan said: "I am delighted to appoint David to this important role. He is a proven business leader who has the expertise in leadership and governance crucial to helping Ofsted through a significant period of change and reform." She said he had showed commitment to higher standards in schools and "particularly the most disadvantaged" children. Mrs Morgan added: "I am confident that his strong track record in business and the passion he demonstrated throughout the interview process will be of huge benefit to Ofsted. He and Sir Michael Wilshaw will make a superb team." However, the National Union of Teachers said the appointment suggested "a politicisation of school inspection". Who is Ofsted's new chairman? David Hoare is a man with more than 30 years' business experience. It is this, the government says, that prompted his appointment. Since January he has been a trustee of the AET academy chain which runs about 70 schools in England. The chain expanded rapidly and has been criticised by Ofsted. In March last year it was prevented from taking on any more schools. Mr Hoare was brought in here as an academies ambassador for the Department for Education to help make improvements. He has led a number of large companies including DX group, Virgin Express and V Ships and also worked for management consultancy firm, Bain and Company. "This could further widen the credibility gap between Ofsted and schools, and the new chair will need to demonstrate his competence to chair the school inspectorate in an impartial manner with regard to all academy and community schools," said the union's deputy general secretary Kevin Courtney. Baroness Morgan has previously said there was a "determined effort" to appoint Tories to the job. Then Education Secretary Michael Gove's unexpected decision not to extend her three-year contract prompted a coalition row, amid speculation that multimillionaire Tory donor and Carphone Warehouse co-founder David Ross would be appointed. Baroness Morgan was previously a senior aide to Tony Blair when he was prime minister. 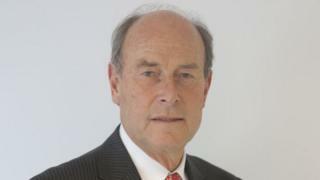 BBC political correspondent Vicki Young says Mr Hoare's appointment would be "far less controversial" than that of former front-runner Mr Ross. Mr Hoare has chaired of a number of other companies including mail firm DX Group, Virgin Express, Paragon Group and Laura Ashley. He has no political affiliations and is also a trustee of the Teenage Cancer Trust. Mr Gove was replaced as education secretary by Nicky Morgan in mid-July. AET chairman Ian Foster congratulated Mr Hoare on his appointment and said: "His support has contributed to our steady progress, as demonstrated by a 6 percentage point increase in our Key Stage 2 results this year. In 2013 we saw a 5% rise in the percentage of pupils gaining 5 GCSE passes A-C across the group."